My new favourite eyeliner is MAC's Fluidline in Blacktrack. 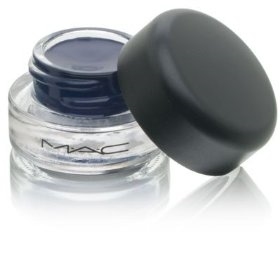 It is a gel-based liner that goes on incredibly smooth and has outstanding lasting power. I can wear this liner all night and even sleep in it (not recommended!) and it will still look perfect the next morning even when the rest of me looks like I spent the night in a gutter. For the smoothest application, be sure to use an angle brush to apply the eyeliner. Then, with your brush, just dip in the little pot and apply in short strokes across your lash line. If you have trouble applying eyeliner, just YouTube a tutorial. There are tons out there with great tips! Fluidline is available in six colours and each pot is $18 CAD. Seems steep, but it will last you a long time and the product is high quality. Worth every penny for some intense, pretty peepers.